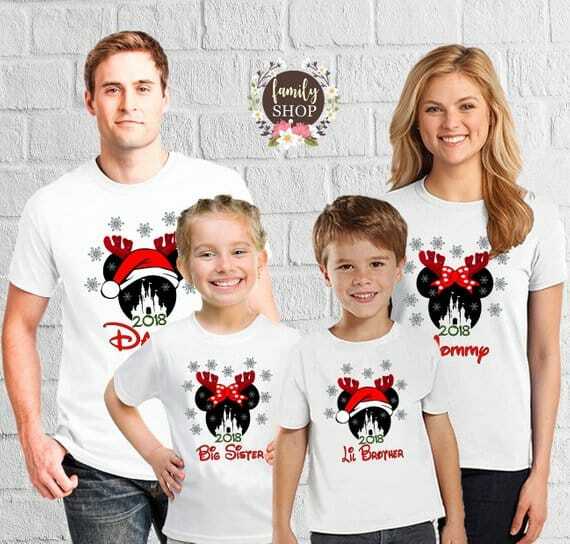 These matching Disney Christmas family shirts are perfect for your vacation or Disney cruise. Go on get in the festive spirit! 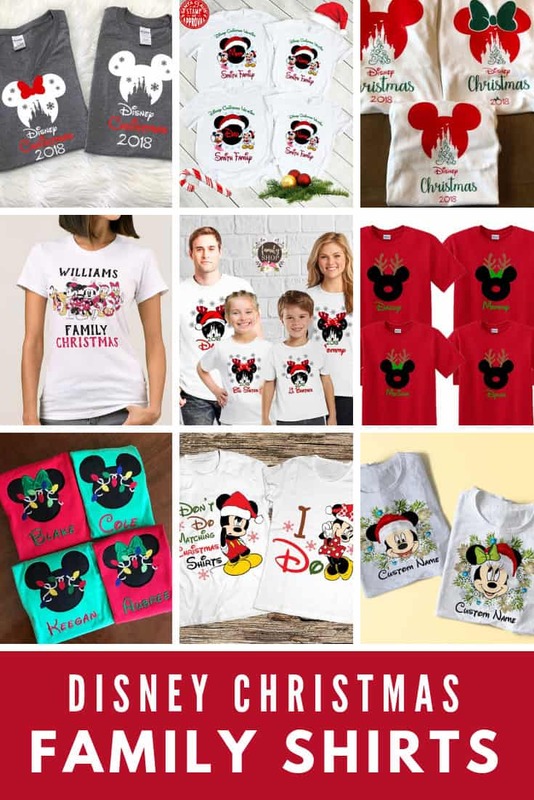 We LOVE wearing matching shirts on vacation and our collection of Disney shirt ideas has been so popular with our readers that we thought we’d bring you another collection… this time we’re getting into the Holiday spirit with the cutest Disney Christmas family shirts we could find! 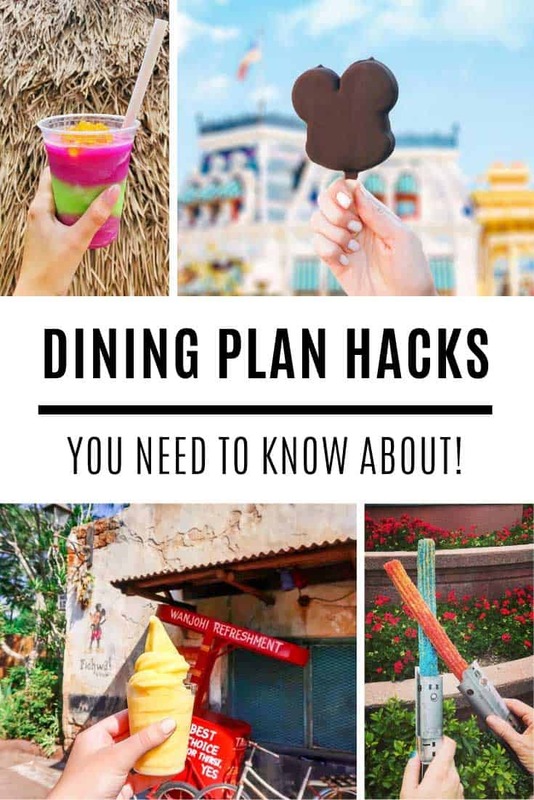 Whether you’re heading out to Mickey’s Very Merry Christmas party, taking a Disney cruise over the Holidays or just having fun together as a family at Disney World (like we will be!) 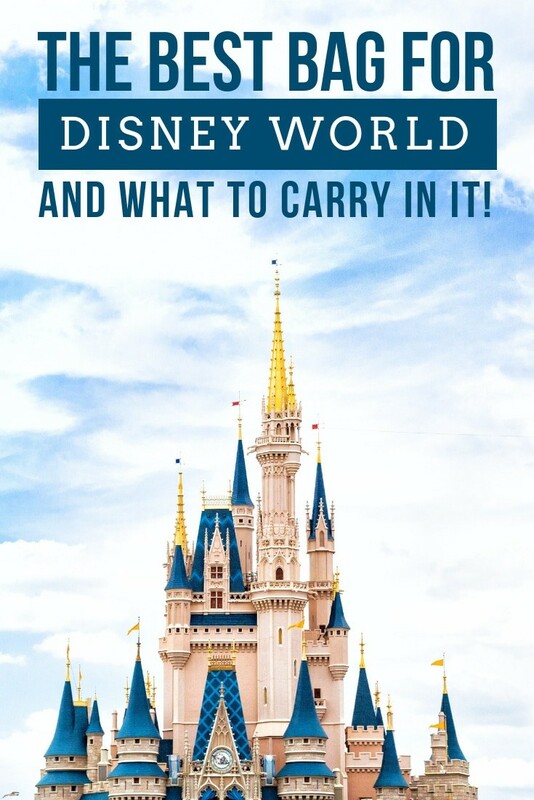 these matching shirts will make your trip just a little more magical. The characters you meet are sure to love them and they’ll look great in your Cinderella castle photos too! 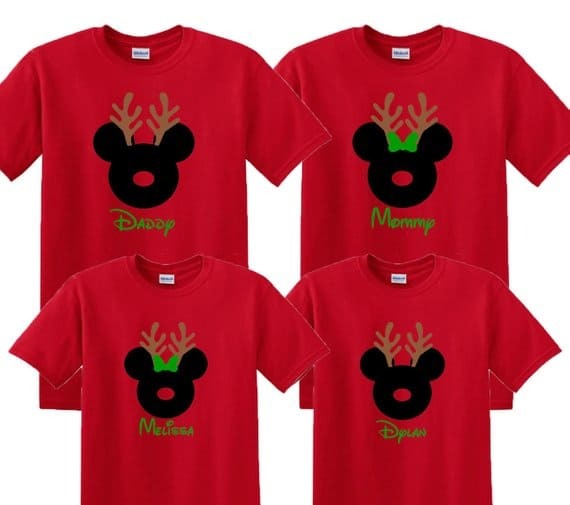 I love these shirts where the Mickey head has been turned into Rudolph, complete with antlers and a red nose! 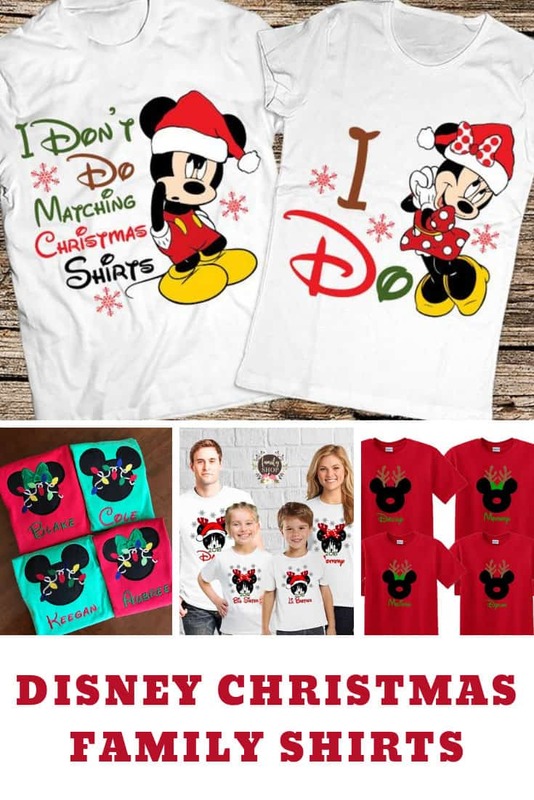 These are custom matching shirts so you can have your name added to them in the Disney font. 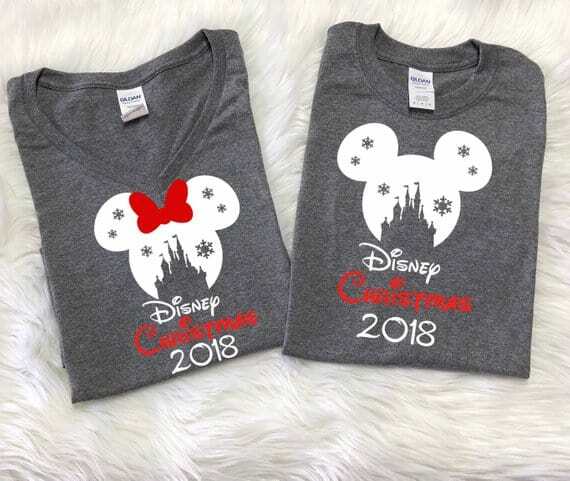 If you’d prefer white shirts take a look at these, again they have the distinctive Mickey, and Minnie heads but this time there’s a cut out of Cinderella Castle. You can ask to have your names added to the design if you want. 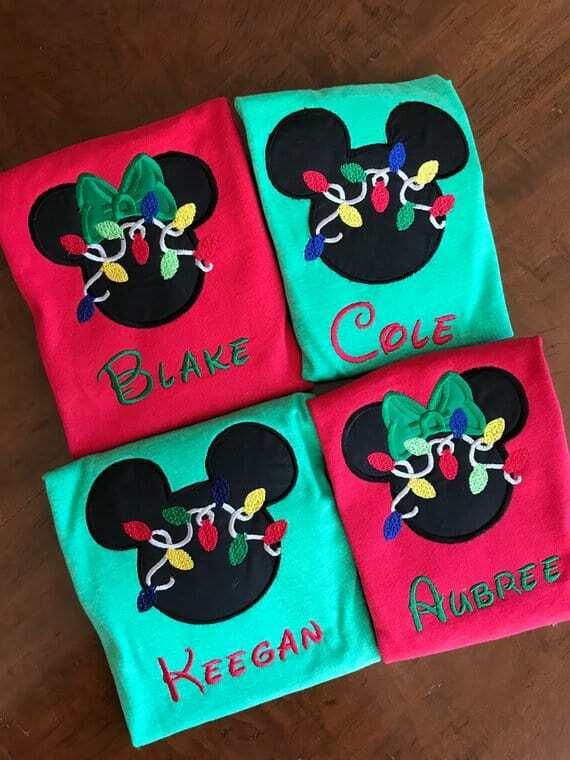 They’d be perfect for Mickey’s Very Merry Christmas Party! If you like V-necked shirts take a look at these grey shirts. 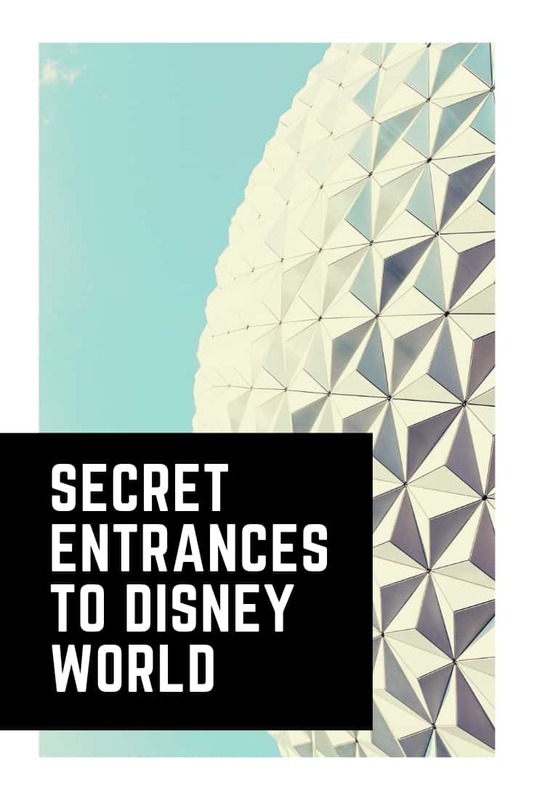 Again they have the Mickey head shape with the castle in silhouette and some snowflakes. Ha! 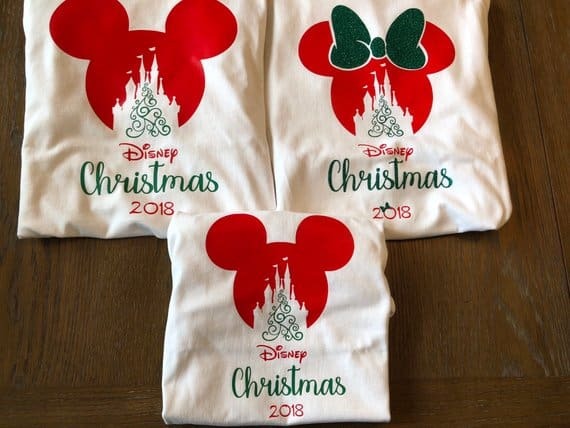 LOVE these matching Christmas shirts! 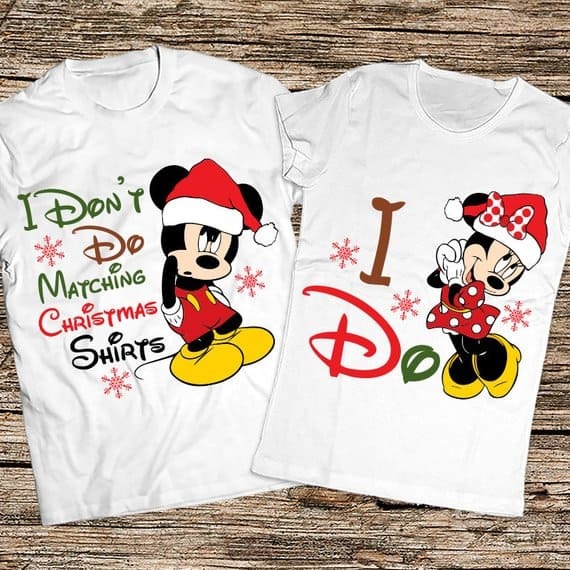 Just perfect if your other half is a little bit grumpy and always says he doesn’t do matching even at Disney! If you prefer your vacation shirts to be appliqued rather than printed take a look at this festive design! I love the strings of fairy lights and you can have your names embroidered on too in the Disney font. 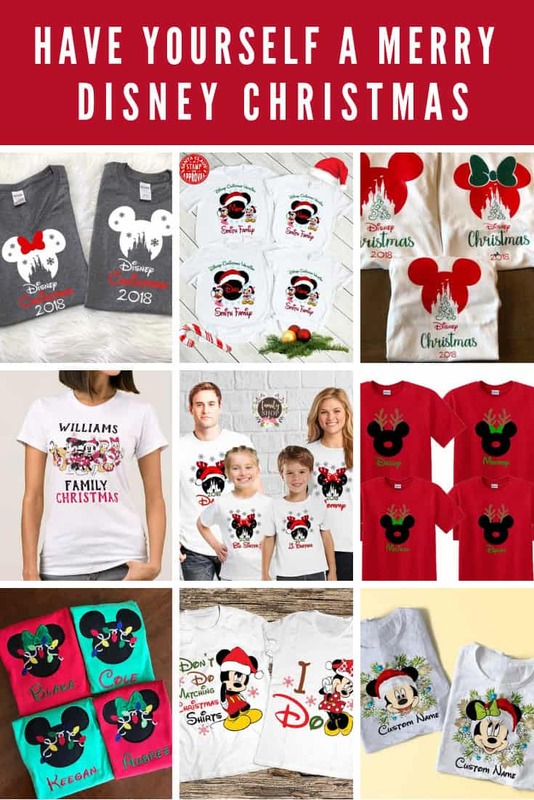 Wow there really are so many different ways to Christmas-fy those Mickey ears on a shirt! This design has Santa hats as well as the reindeer ears. 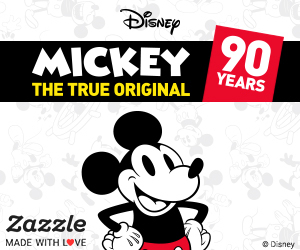 You can add your names to this design as well as the year of your trip. Oh how adorable is this design with Mickey and Minnie inside a Christmas wreath! 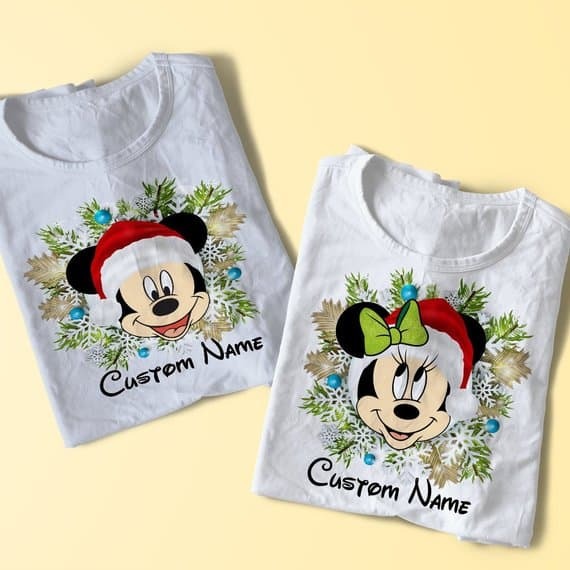 You can add your names to this custom shirt and they come in all sizes so they’re perfect for having the whole family wearing matching shirts for your vacation. 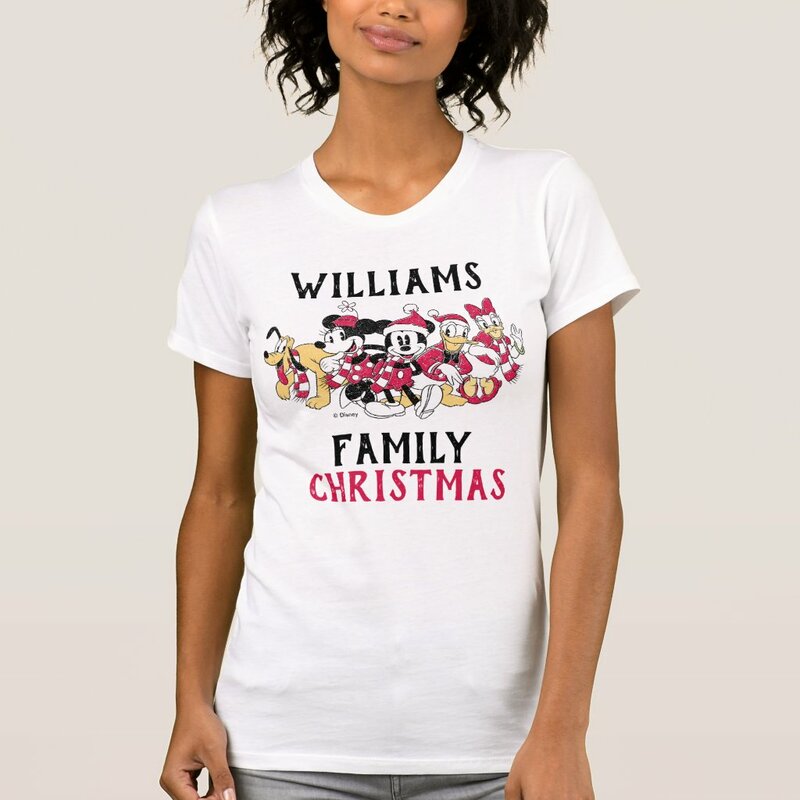 This cute design has the fabulous five all dressed up for the Holiday season and you can add your family name to personalize.